Our team of trained office relocation professionals provides seasoned expertise in office furniture installation and reconfiguration. Beginning with our pre-job review of the design, our installation technicians approach your job as skilled craftsmen, concerned with doing the job right the first time. 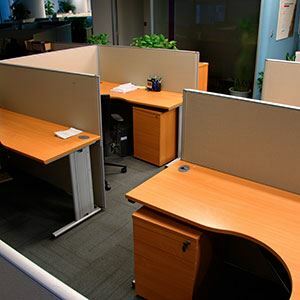 Where other office furniture moving companies will often leave you hanging, when it comes to installation services, CRN provides the whole package, with our team of office relocation experts. We are experienced with all furniture manufacturers, and provide modular/system furniture installation for new and existing furniture. Need a library or file room shelving system? Or, perhaps, industrial shelving and pallet racking? No problem. We bring the know-how to set up your workspace exactly how you want it and do all the work for you. We even anchor file cabinets, level items, polish your furniture and clean the whole area. With CRN, you are not just getting another commercial moving company— you are getting an entire team of experts fully trained in every area of office relocation. We’ll even sit down with you and help to plan out your future space with systems furniture installation drawings. And with our keen focus on efficiency and quality without compromise, you can be sure that you are getting the very best service so that you can fully enjoy your new workspace in no time at all. Space Planning & Systems Furniture Installation Drawings.